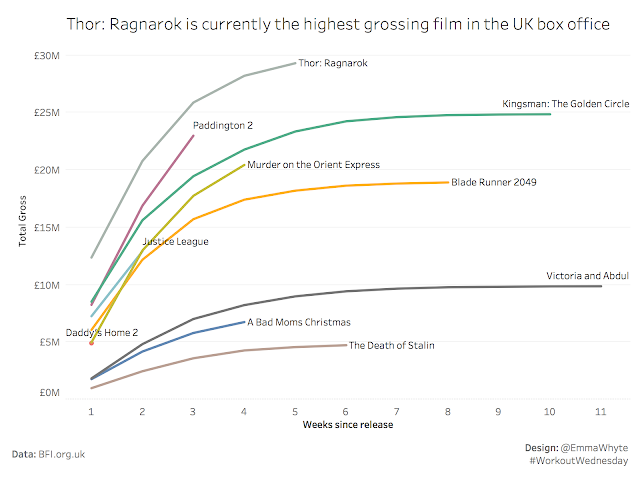 This week I've taken a look at UK Box Office data, downloaded from BFI. You should create this visualisation to be dynamic. You should NOT filter the films in the chart to the ones shown. You should create it so that if new data is added, films which are no longer being shown in UK cinemas are dropped from the chart. So if a film has no row of data for the latest week, it should completely disappear from the view. That's it! You can download the data to get started on the challenge. When you're done remember to tweet @EmmaWhyte and @VizWizBI with #WorkoutWednesday to show us how you got on. Yesterday, I did my first try to make this vizualization. I am stuck with vizualizing other weeks ( from first release to last release).